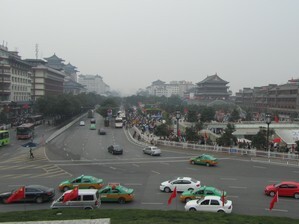 I found Xian surprisingly pleasant on my last visit in 2011. It is certainly a city one could consider living in for a year, teaching English or something while learning Tai Chi with one of the schools. 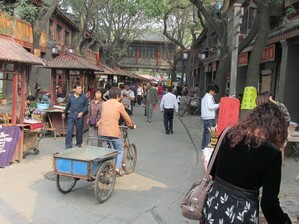 The city retains its fortified walls, and has many old districts especially around the Xian Museum with its superb collection of Buddhist sculpture and Stone tablets with ancient writing on them. Personally I found this of more interest than the Terracotta Warrior site, though that's also worth seeing. There are many historic sites in the area and so if you are coming to China for a short Tai Chi training period, this is a good area to base yourself to see a bit of culture as well as do your training. There is a strong Muslim minority in the city and this gives it more feeling as well compared with most other cities in China. I believe there are some parks around Xian but I didn't visit them on my last stay. I found quiet areas to practise my Tai Chi around the edge of the fortifications and moat which was a kind of park land. Accommodation for short stay will be listed in guide books - prices seemed to be about 120Y for a hostel room, less for a dormitory bed and reasonable food was available onsite. Tai Chi is very high quality in Xian. I'm aware of quite a lot of teachers in the area : Traditional Yang Style, Chen Da Jia, Chen Xiao Jia all at absolute top level so this is an interesting place to look for a teacher. For those interested in staying long term, the city is wealthy and I'm quite sure there is a high demand for English teachers so the scenario of working for a year or two and training to high level in your taichi looks fairly straightforward to achieve here. The China Taichi Guide : An Introduction to Xian. Xian is one of the cultural capitals of China and as such has a wealth of taichi schools and teachers. 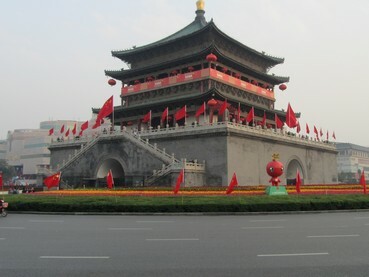 Xian is also an interesting city to spend time in visiting the historical sites and enjoying the feeling of tradition, rare in modern China. The China Tai Chi Guide is a directory of Tai Chi Schools and Teachers in China.